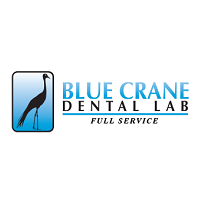 WELCOME TO BLUE CRANE DENTAL LAB Blue Crane Dental Lab provides dentists and dental professionals with outstanding quality, great prices, and unmatched service. Our experience and dedication to our clients sets us apart. Blue Crane Dental Lab is a Full Service Dental Lab with experience in all aspects of the Dental Industry since 1983. Through our knowledge of the Pankey/Dawson Philosophy and understanding of Interdisciplinary Case Planning, we have enjoyed success and predictability with all our cases. We maintain a high standard of quality control where all cases are evaluated and checked from start to finish. Our main focus at Blue Crane Dental Lab is to create natural aesthetics while utilizing the fundamentals of occlusion. We specialize in All-Ceramic Crowns and Veneers, Porcelain fused to Metal and combinations of fixed removable and Implant work. We believe in personal contact between Dentist and Technician, thereby achieving a higher degree of patient satisfaction. If you have any questions or would like to receive more information please visit our online resources or get in touch by contacting us.